Person-to-person (P2P) payments are exploding, particularly when it comes to mobile-enabled transactions. Over the short term, this may have little impact on the merchant acquiring space. But long term, it should drive more mobile POS payments and more small merchants to electronic payment acceptance. Mastercard and Visa are betting on this. Over the past few years, the two have launched several initiatives intended to drive more P2P payments to their networks. Visa has been signing up leading banks, processors and technology companies for Visa Direct, a card-based platform that promises to deliver P2P transactions almost instantaneously to any person or small business with a debit card. 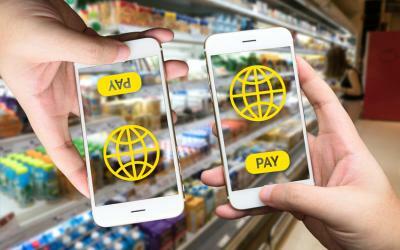 "Our network has gone from being the preferred rails for face-to-face transactions to now being the preferred rails for ecommerce transactions, m-commerce transactions [and] the backbone for P2P transactions," Vasant M. Prabhu, Visa executive vice president and chief financial officer, said in a recent presentation to analysts. Mastercard is advancing pilots in Africa and Asia that support micro- and small-merchant acceptance of contactless payments using the Facebook Messenger platform. The new Masterpass QR (quick response) bot is available now for merchants in Nigeria and Tanzania, two predominantly rural countries where large swaths of the population are unbanked, but most carry mobile phones. In Nigeria, for example, the government reported that 40 percent of the population is unbanked, yet 80 percent have mobile devices, and nearly two-thirds of those are smartphones. According to research by the Mastercard Center for Inclusive Growth, 96 percent of the over $300 billion in funds that flow from consumers to businesses in Nigeria in 2017 involved cash. Shop owners who want to accept mobile payments and either are unbanked or lack the resources necessary for traditional mobile POS acceptance devices start the process by sending a request through Facebook Messenger. That triggers a bank account approval and setup process that results in issuance of a QR code, which the merchant can either print and display in store or save to a mobile device. Two banks in Nigeria and one in Tanzania currently support Masterpass QR. Customers initiate payments by using smartphones to scan the QR code, or by entering the merchant ID associated with the code into their phones. "By offering QR-based digital payments, smaller retailers [can drive sales and improve customer stickiness] with little to no investment beyond the phone they already have," Jorn Lambert, Mastercard executive vice president of digital solutions, said in a statement. P2P mobile payments chart triple-digit growth In the United States, P2P payments are charting significant growth, but cash and checks dominate the payments mix. Among Americans who made P2P payments in 2017, 50 percent said they used cash, followed closely by PayPal (48 percent) and check (41 percent), according to a survey by Aite Group LLC. In all, Aite estimated U.S. households initiated 8 billion P2P payments in 2017 totaling more than $1 trillion. The most common reasons: various types of gifts and paying individuals for goods and/or services. Mobile-initiated payments account for fewer than one in 10 of total P2P payment dollars today, but Aite's senior analyst Talie Baker said mobile channel adoption is gaining. "People are starting to understand the technology, and they're starting to use it," she said. "When we did the survey in 2015, 22 percent [of consumers making P2P payments] said they had made mobile P2P payments [the year before]. Three years later, it was almost half," Baker said. Sarah Grotta, director of the debit and alternative products advisory service at Mercator Advisory Group Inc., suggested online and mobile P2P payments may soon rival debit card usage. "We are finding that consumers are just as likely to say they use a debit card as they are a P2P product," she said. Baker added, "I would expect over the next five years to see a huge move to mobile payments, particularly with Zelle and Venmo." Zelle is a mobile P2P payment network launched by a consortium of banks to compete with PayPal's mobile app, Venmo, and Cash, Square's P2P app. As of late April 2018, over 100 banks (including many of the nation's largest) were either on Zelle or committed to joining the network, according to Early Warning Services LLC, which operates Zelle. Zelle lets consumers send money directly from their bank accounts (accessed using existing mobile banking apps) to the accounts of other consumers using only recipients' email addresses or mobile phone numbers; good funds are typically available within minutes. Customers of banks not on the network can download an app from Apple or Google Play and direct Zelle payments to their debit cards. Early Waning reported that Zelle was used to move $75 billion in P2P payments last year. That's more than twice the yearly total sent via Venmo in 2017, which was $35 billion according to PayPal. And data from the first quarter of 2018 suggests Zelle payments continue to outstrip those processed through Venmo. Venmo continues to count more users, but Cindy Liu, forecasting analyst at eMarketer.com, said Zelle is on track to soon surpass Venmo in total users as well. Liu is forecasting that Zelle will have 27.4 million users by year-end 2018, up from 15.8 million at year-end 2017, and that Venmo will grow its user base from 17.3 million in 2017 to 22.9 million this year. Square Cash runs a distant third with an expected 9.5 million U.S. users by year-end 2018. "One of the main hurdles new apps face is building trust and a sizable audience," Liu said. "But Zelle has leapfrogged the early stages of adoption by having the benefit of being embedded into the already existing apps of participating banks." Liu expects the number of Americans making mobile P2P payments to grow 30 percent this year to total 82.5 million people, or about 40.5 percent of U.S. smartphone users. The total value of domestic mobile P2P payments in the United States will grow 37 percent and total $167.08 billion this year, Liu predicted. The existence of multiple options for mobile P2P payments has a downside: lack of interoperability and the need for consumers to manage multiple mobile payment apps. "Especially for older generations, we think multiple apps hinders adoption," Baker said. Older Americans are generally less inclined to use their mobiles to initiate P2P payments, but they don't reject it out of hand. Nearly 70 percent of millennials and nearly 50 percent of Gen Xers who made domestic P2P payments in 2017 used a mobile payment app, Aite found; just 24 percent of baby boomers and 14 percent of preceding generations (the silent and greatest generations) who made domestic P2P payments did so via their mobiles. In a report on the survey findings, Person-to-Person Payments: How Americans Pass the Buck, Baker said ubiquity must be a key driver of mobile P2P payments. "Ubiquity in mobile P2P payments will not exist without interoperability between services," she wrote. "Forward-thinking mobile P2P providers that solve the interoperability problem will surely be the ones that win the race to dominate the P2P payments market." Patti Murphy is Senior Editor of The Green Sheet and President of ProScribes Inc. Follow her on Twitter at @GS_PayMaven or email her at patti@greensheet.com. Surcharge versus cash discount - what's the difference? Konstantinos Papakonstantinou , Board Studios Inc.